Featuring an open top design for speed, covered trigger guard for safety, and tension screw adjustment for added security, the Speed Paddle adds convenient on/off ability to the equation. 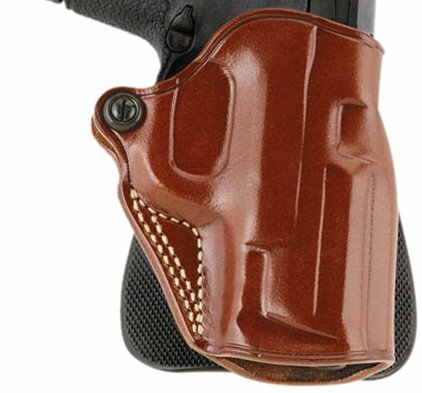 This holster also includes Galco’s patented copolymer injection-molded belt-lock paddle, which makes it possible to put on and take off this holster without removing your belt. Constructed of premium saddle leather, the Speed Paddle fits belts up to 1 3/4". Available for double-action revolvers and compact autos, the Speed Paddle is available in right or left hand designs, in tan or black finish.